I have owned my TC for 23 years and the car has never really had any brakes. I think a stick dragging on the pavement would have been more effective than my old TC's binders. So I set out to fix things this fall, and below I will go through the problems that made my TC brakes so pitiful. The TC brake shoe has an offset in the metal part of the shoe. The reason being is that the shoes overlap on a post at the bottom of the backing plate. 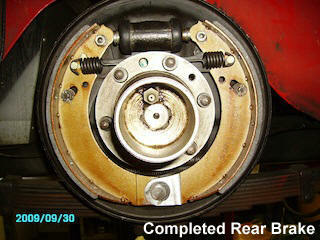 You must notice this and make sure your brake shoes are assembled properly. Don't ask how I know this! Also, TC drums are pressed steel. Not cast iron like a real car. The thickness is about 3/16" or so. Mine had been turned twice so the metal was probably 1/8" thick or thereabouts. I could feel the drums "bell" if I applied the brakes hard, which I had to do with regularity when I drove the MG. Also the rear shoes were oil-soaked and the fronts were silicone-soaked. So driving my TC had become like ice racing, just going to the 7-11. Downhill runs were to be avoided! The new shoes from Moss looked great. The metal part of the shoes needs to be just under .120" thick at the point where they slip over the aforementioned post. Any more and the retaining horseshoe clip will either not fit into the groove of the post or if you do force it on, the shoes may bind. Moss's otherwise excellent new shoes were .137" thick and had to be milled down to fit. I contacted Moss and they went out of their way to quickly investigate the issue, take steps to remove defective stock, and contact their supplier in the UK. I was pleased with their actions to correct the problem. extensions have clearance here that can allow the bearing carrier (and seal) to flex at the bearing, leading to oil leakage to the brakes and possibly axle breakage — especially under hard cornering loads. "TCs Forever" covers this extensively, and all TC owners should refer to this book for the repair technique. 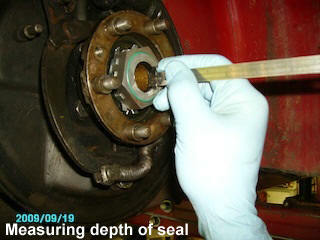 By the way, sealed bearings are fine here, but they seal to keep dirt out, not oil in. The wire wheel hub to bearing fit was good on my car, so the big fix for my TC hopefully will be the new hub seal nuts offered by Bob Granau in Ontario. Bob is a machinist who makes special parts for T-series and MMM cars. His seal nuts replace the stock large castellated hub nut with a fully machined 2" nut with an integrated modern seal. When installed, the axle is slid through the nut as normal, but the final position where the seal will contact the axle is made smooth by installing and accurately positioning a 1" Speedi-Sleeve. The sleeve slides right down the axle and may need a little bearing Lock-tite on the cleaned axle in order to keep it from shifting. 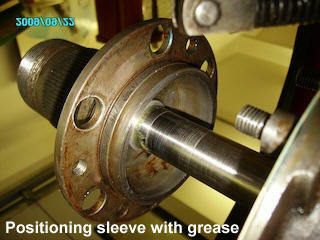 By using grease on the sleeve and inserting and removing the axle, you can see the sleeve's position in the seal. See the photographs for clarification. Last, at least for the purpose of this article, was the full flushing of the silicone brake fluid and an overhaul of the wheel cylinders and master cylinder. Some of you will remember that silicone brake fluid was all the rage back in the late 70's. I switched back to Castrol LMA years ago, and it's all I'll use. Check with your NAPA store as they may carry Castrol brake fluid. They also should have assorted wheel cylinder cups that, although universal, look just like the Lockheed parts and are much less dear. NAPA #3023 for 7/8" and #1499 for 1". In addition, I had Bob Granau install new machined stub axles into my original front steering knuckles. This I'll cover next time. If you google "MG TC Hub Nuts," you will find a way to modify your original castellated nuts if you are so inclined. Also, see: www.mg-tabc.org/t-list-gall-class.htm for Bob's parts and services list.